It is with some trepidation that I write this post. There are now just 9 days to go until the London marathon, and this will be my final fundraising post for the event. It has come up so quickly! Whilst in many ways I feel prepared, it is also daunting to think that race day is so soon. I suspect that this week will be all about mental preparation as my physical activity tapers off and the 26th April draws steadily closer. Since my introductory fundraising post I have shared 12 further recipes for this series. I really hope that you have enjoyed them, and that they may prompt you to consider making a small contribution via my fundraising site. I am incredibly grateful to those of you who have already done so. If you had planned to contribute and are yet to do so, now is definitely the time! Donations of any size add up to make a difference and everything goes directly to Beat, the UK eating disorder charity. No amount is too small and anything and everything is greatly appreciated. 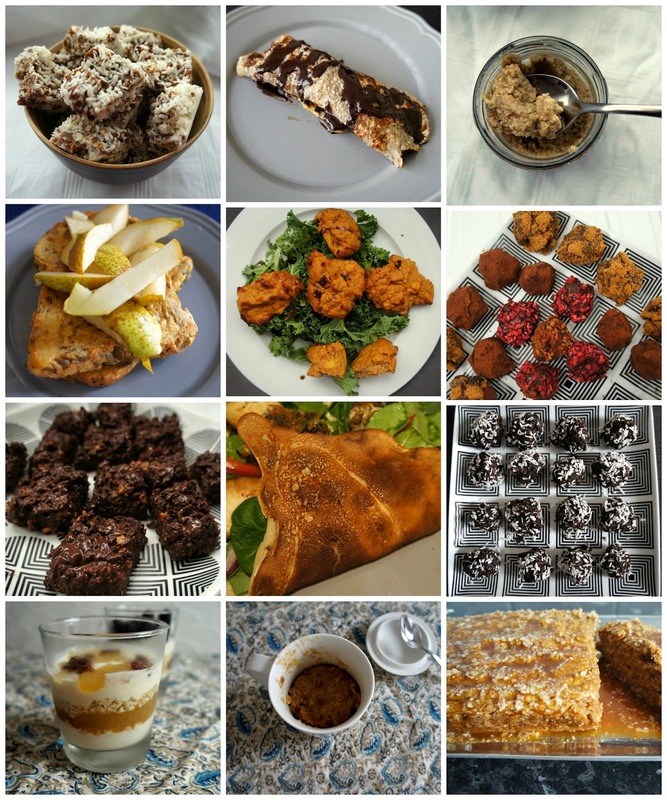 I have summarised my previous fundraising recipes below, but today I am shining the spotlight on this final contribution to the series. I think the name alone makes me swoon a little bit: caramel sweet potato fudge. It is fudgy and decadent but requires no butter or vegan equivalent, no white sugar, no candy thermometer, and hardly any time. Plus, it combines vegetables and fudge all in one. What is not to like?! I should say that you do actually need to like sweet potato in order to enjoy this. I don't know many people who dislike the vegetable (except, sadly, Mr Bite) but you will know sweet potato is in the fudge. However, it is complemented beautifully by coconut sugar and lucuma powder and the taste experience is definitely dessert. The caramel tones are warm and inviting, and it is very hard to stop at just one piece. Microwave, steam or bake your sweet potato until fully cooked. Peel and, while still warm, process in a food processor or high-speed blender with the coconut oil, coconut sugar and lucuma powder. Smooth the mixture into a baking tin lined with baking paper or a silicon baking pan. Allow to set in the fridge overnight or for at least 6 hours. Cut into squares and store in the fridge for as long as you can make it last. For those of you who have run marathons - any bits of advice for this last week?! Wow the fudge looks absolutely delicious! We are sweet potato lovers over here, so that shouldn't be an issue :). Sending you zen thoughts in these last days before the race! This is so creative! I definitely have to make this - I love that you've turned a vegetable into a sweet treat! Good luck for London! What fabulous looking fudge - you'd never know it was actually healthy! Good luck with the marathon. It looks fantastic - I confess the coconut oil is more of a deterrent than the sweet potato - and also my lack of lucuma but it looks so good that I want to overcome the obstacles. And your recipes for the fundraising posts have been great - I actually made the cheesecake puddings yesterday - well as version of them that I will post anon. Good luck with preparation for the marathon and for the big run itself - I hope your fundraising reflects your amazing efforts here on the blog. Thanks so much Johanna, and I actually thought of your recent coconut oil comments as I posted this :-) If it helps, I couldn't tell it was in there, although that doesn't mean you'll be the same. Lucuma powder lasts me a while but I do find it a nice caramelly ingredient for all sorts of things! It really has crept up, hasn't it! Thanks so much Charlie. I think I once found it in Woolworths, but may be making that up :P Health food shops are probably your best bet - I hope you find some to play with eventually. SOOOO exciting!! You are going to ROCK the race. I am super in love with this sweet potato fudge - what could be better?! I have been intrigued by sweet potato brownies but I love your idea to make fudge with them. I still have to try the brownies! Thank you so much for sharing such an incredible array of recipes as part of your fund raising efforts these past few weeks. I'm looking forward to trying them all in time, starting with this fudge. It looks so 'fudge-like'. I can't believe there's sweet potato in there! Thank you so very much for sharing this at Healthy Vegan Fridays. I am featuring this recipe and linking up to your fundraising page! Good luck on Sunday. I'm so glad you like them - and lucuma! - Kim. And thanks so much for featuring them, I really appreciate that! These 3 studies from large medical journals are sure to turn the traditional nutrition world upside down!